Hawaii’s clinicians are an important part of the process! The U.S. Outpatient Influenza-like Illness Surveillance Network, or ILINet, is a nationwide network of healthcare providers that report information on outpatient visits for influenza-like illness (ILI) to the Centers for Disease Control and Prevention (CDC). This data provides pictures of circulating influenza viruses and ILI activity at the local, state, and national level. Why does Hawaii need ILI Sentinel Providers? ILINet providers are critical to the success of Hawaii’s influenza surveillance program. An ILINet provider conducts surveillance for influenza-like illness (ILI) in collaboration with the Centers for Disease Control and Prevention (CDC). Data reported by sentinel providers, in combination with other influenza surveillance data, provides a national picture of influenza virus and ILI activity in Hawaii and the U.S.
ILINet providers report the number of outpatient visits and the number of patient visits for ILI by age group (0-4 years, 5-24 years, 25-49 years, 50-64 years, and 65+ years) each week throughout the year. These data are submitted weekly via the internet or fax to a central database to CDC. Most providers report that it takes less than 30 minutes a week to compile and report their data. In addition, sentinel providers can submit nasal, throat, or nasopharyngeal specimens from patients with ILI symptoms to the Hawaii Department of Health (HDOH) free of charge. HDOH, in partnership with the State Laboratories Division (SLD), performs free RT-PCR influenza A/B testing and typing. Results are available for providers to view electronically through a web portal. Clinical providers including physicians (MD/DO), nurse practitioners, advanced practice nurses, registered nurses, and licensed practical nurses in most clinical practice settings are eligible. We are especially interested in enrolling providers in family practice, internal medicine, pediatrics, emergency medicine, university health centers, and urgent care settings. Sentinel providers must be practicing and be able to see patients for influenza-like illness. Data from sentinel providers are critical for monitoring influenza’s impact and tracking trends nationally and in Hawaii. In conjunction with other surveillance data (Hawaii’s Influenza Surveillance Program), they can be used to guide prevention and control activities, vaccine strain selection, and patient care. Sentinel providers have access to HDOH and CDC web portals to download their previously submitted data. 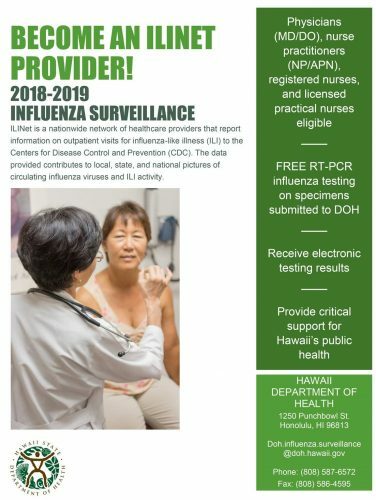 In addition, providers can also view data that are summarized and reported along with other flu surveillance components in the weekly and annual Hawaii Influenza Surveillance Report. Sentinel providers are key to the support of Hawaii’s public health. For more information or to enroll as a sentinel provider, contact the Influenza Surveillance and Response Coordinator at (808) 587-6572 or DOH.flu.surveillance@doh.hawaii.gov.